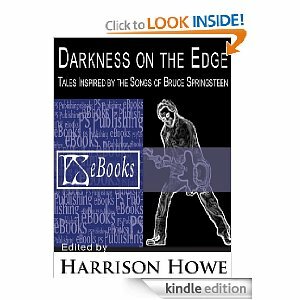 Howe, Harrison – Darkness on the edge | Better days! The idea to have short stories written on the base of Springsteen songs is of course brilliant. And very logical, seeing that most of his songs are just perfect little short stories with (often) a great beat. And those who do not tell a story, usually paint such a clear picture that one can easily also use it for a story. I am sad to say, however, that I did not like the book at all. And no, NOTHING against the editor or any of the contributors. My problem was just that I simply did not like most of the stories. It seems to me that many of the authors tried to wring too much out of the songs. Of course it may just have happened in their quest for originality. Most of the stories are just too far-fetched for my taste. Often it was very difficult even to recognize the song in the story. Of course, many of you will disagree with me. There were, however, two important exceptions. Firstly the story based on Thunder Road, Wings for wheels by John Palisano. One could recognize the characters of the song immediately, and of course the milieu where the story played itself out. One could get the ambience of the town and you could experience and feel with the characters. But the one that I absolutely loved was With these hands (inspired by Factory – one of my absolute favourite Springsteen songs – and Two Faces) by Kurt Dinan. This is the heartbreaking story of a young man working in the factory where his father used to work. He experiences everything that Bruce so often sings about – the dead-end job, the falling in love, the dreams, the stark reality of bad relationships (especially with his father), the danger of losing the love of his life in the hardships of real adult life. And of course the very real danger of household violence born from frustration and helplessness. But this young man sees a way out. And he takes it. In a very shocking and heartbreaking way. And no, I am not going to tell you! The third part of the book that I enjoyed very much was … the Introduction. J I revelled in a lot of the editor’s comments on Springsteen’s work. Here is just one example: … I think it’s the brutal honesty of Springsteen’s songs … his ability to tap so deeply into the human spirit, to not shy away from man’s weaknesses, his vulnerability to failure, to feel pain and inflict pain, to question himself, doubt himself, question the world around him. Do I recommend the book? Yes, although I did not enjoy most of the stories. That was probably just a question of personal taste. Especially male fans should enjoy it very much. And yes, a new dream was born from reading this book: To one day write some short stories of my own, inspired by Springsteen songs, but set in South African circumstances and populated with South African people. I think it is very possible to do that, because Bruce’s songs are specifically American, but they are also very, very universal. Because, basically, we are all the same.